As you complete the teacher certification process, you’ll probably start to think about when and where you should begin looking for that perfect teaching job. There are a number of options, but there are still a few things you need to know so you’ll be able determine which are the best places for you to find teaching jobs. First off, where do you look? There are several options when it comes to searching online for a teaching position. For example, you can look at teaching-focused websites like Schoolspring.com or Educationamerica.net. These types of teaching job websites help both the hirer – by providing a page where schools from all over the country can post their job vacancies – and the applicant, by filtering the educational job postings on the larger job search websites like Indeed.com or Monster.com. 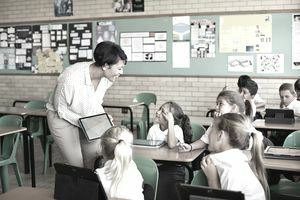 Another way to locate your first teaching position is to go right to the source by visiting the websites of the school districts where you’d like to teach. Often, you’ll find links on the websites where the schools list employment opportunities in their districts. When searching on school district or board of education pages, you’ll find job openings for a variety of positions. You may come across teacher's aide positions or long and short-term substituting positions, both of which are great ways to get your foot in the door. Think of working as a substitute teacher as a way to sample different schools or grade levels, or as a way to put you in the right place at the right time when that perfect job opens up. Many districts start posting job openings in early spring. However, this is not a set rule, and a position could pop up at any time. So, become a frequent visitor to job search and school district sites. In addition, some districts accept applications all the time, through the use of online application systems. These types of systems are an effective way to apply for every job that matches your specialty. Once you fill out the online application and upload your transcripts and teaching certificates, you can apply for job openings as they come up with just a click or a tap. These types of online application systems also allow you to make your application searchable so that the school districts can find you when a job that fits your certification and interest opens up. If you hope to be working in the fall after you graduate, it’s best to start your job search as soon as possible. The interview and hiring process can be lengthy because there are often many interested candidates for every open position. Most school districts will give all qualified individuals an initial interview and then begin the process of elimination, which may involve several more callback interviews. You’ll need to be patient and it’s a good idea to apply for more than one teaching job if possible. In fact, the key to landing your first teaching job is to not put all your eggs in one basket. It’s acceptable to apply for several jobs at once and if you get multiple offers, you can accept the job that fits you best. If you get more than one teaching job offer, you may even be able to negotiate a better salary. Some factors that affect the duration of the interviewing process include the type of position you’re applying for, the date the job is available, or the urgency to fill the spot. Time of year may make a difference as well. If you’re applying for a job in a "high needs" field like special education, science or math, then the process may not be as drawn out. School districts often like to snap up teachers who have degrees in these fields before other districts hire them. However, when you apply for a job in a more general field like elementary education or physical education, the hiring process may involve multiple interviews, which could span several weeks or months. While teaching in regular brick and mortar school districts is more common, the number of online schools continues to keep growing. There are a variety of teaching and education-related positions available for teachers who want to work from home. How Long Does it Take to Find a Job?